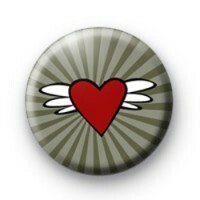 Grey 25mm Badge with a winged red love heart. Great badge for anyone that is lucky in love or optimistic of meeting Mr/Mrs Right. It is a fab badge to give as a love token and spread a little romance, especially on Valentine's Day. We have lots of fun, sassy love themed badges in the shop & we even have a few Anti-Love badges if that is more your thing.